 The Australian Alpine Ascent Ultra trail runs feature two distances, the full 50km and the half 25km which will feature a combination of road and trail tracks. You’ll cross through locations like Perisher and Charlotte Pass and Summit Mount Kosciuszko. It’s brutal, but it’s beautiful and the courses have been designed to showcase the very best of the Snowy Mountains along the way. All parking for the event will be at Perisher Village (in the ski tube car park), and shuttle buses will be provided to get people to the start at Charlotte Pass Village. Details of your shuttle time will be emailed to you in the week prior to the event. All supporters are able to access this shuttle service as well. Shuttle bus provided from finish line at Charlotte Village to car park at Perisher Ski Tube after race every hour. Participants must be self sufficient, with refuel opportunities (water) and drop bags point at Charlotte Pass. If weather is cold, we will supply soup at Charlotte Pass Village (at the halfway point) and the finish line. Must be waterproof with sealed/taped seams. Must be polypropylene or merino. Not a compression top. Heavyweight crepe bandage, not loose crepe. Emergency snack These items are all mandatory, and for your own safety. There will be bag checks to ensure that mandatory items are present. 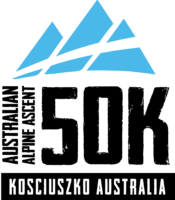 The mandatory gear list is a requirement for both the 25km & 50km athletes due to the highly unpredictable alpine environment. The net gain of the AAA50km is 1520m. 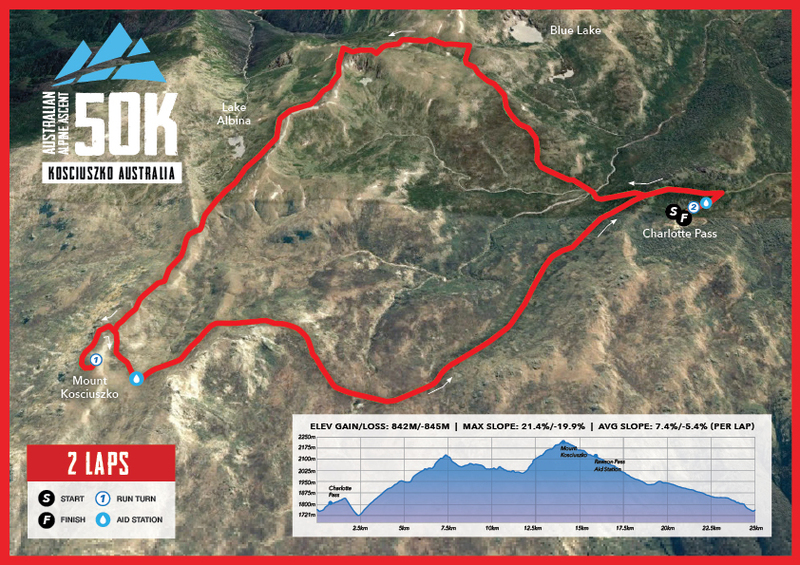 The 50km will have two aid stations – one at Rawson Pass, which you will reach at 17.5km into the run which is a water refill station only, and Charlotte Pass at 26.5km into the run. You will need to be self-sufficient outside of that. The on course hydration will be Powerade hydration. There will also be a variety of foods including fruit, lollies, muffins and packets of chips at Charlotte Pass Village. The cut off for the 50km is 9 hours. There are 2 checkpoint cut offs. Checkpoint 1 is at Charlotte Pass Village at the end of the first lap, participants must make this point in 4hrs and 45mins i.e. 12:45pm. The distance to this checkpoint is 26.5km, and will require participants to average 10.45min/km pace. Checkpoint 2 is the finish line. Participants must make this checkpoint by 5pm, thus giving the last participants through checkpoint 1, 4hrs and 15mins to finish the final 23.5km (i.e. averaging a pace no slower than 10.51min/km). The cut off for the 25km is 8 hours. The minimum age is 18 years for both races. There may be shortening of the route due to adverse weather conditions, and that is something that the National Parks and Wildlife consultant will make the ruling on. The alpine condition can be closed due to thick fog, or snow, even in March. Can I use poles in the race? Yes you sure can, however any equipment you start with you must finish with. Can I stash gear in certain places prior to the race? Yes you can have your own drop bag that can be available for you at the aid station at Charlotte Pass Village. Is there somewhere to put litter on the course? No there isn’t. You will need to carry out what you take in with you. We will have bins at Charlotte Village. What if I need to poop can I use my sock to wipe? If you are someone who may have troublesome bowels on a run like this, we suggest you buy a Go Anywhere Toilet Kit (Wag Bag) from an outdoor retailer, or online. Each toilet waste kit is pre-loaded with waste treatment Poo Powder to gel and solidify liquid waste to a solid. Poo Powder encapsulates solid waste (once activated by a liquid), controls odour and contains a decay catalyst to break down solid waste. After using the kit, carry it with you to the next checkpoint where there will be a waste bin for disposal. We don’t want anyone having a “one sock run”!! !